XPS, expanded as XML Paper Specification, is a page description language that can describe an individual document, which contains multiple pages. Mgosoft XPS To PDF is a simple tool that supports converting your XPS documents effectively, into PDF format files. Mgosoft XPS To PDF facilitates the conversion of Microsoft XPS documents into well-known PDF format files without sacrificing content while giving quality output. It is capable of generating optimized, high quality, and vector-based PDF format files as output out without going over GDI, or going through PDF printer driver. 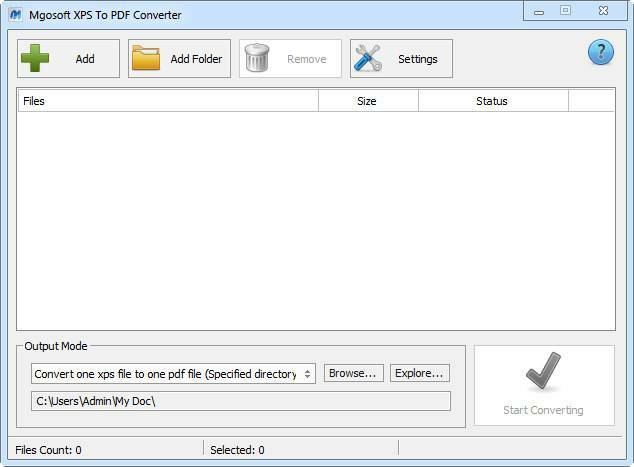 Convert XPS document to PDF file directly, without via a printer driver. Support create a PDF/A document. 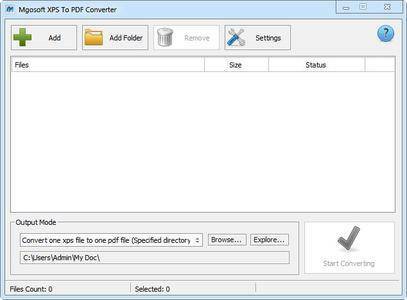 Support each document file be converted into a PDF file. Create "owner password" and "user password" protected PDF file. Set the document title, subject, author and keywords options. Produces PDF documents that are fully text searchable in Adobe Reader. Use it on all Windows version including the latest builds of Windows 10. Operating System: Windows XP/Vista/7/8/10 of both 32-bit and 64-bit.